My family's been in town the last few days, and one of the highlights for me was checking out the Fantasia International Film Festival with my brother. We saw L'Autre Monde, a film that documents some of the goings on in the mystical region of Rennes-le-Château, Montségur, and Bugarach and the stunningly weird personalities that inhabit the place — namely Uranie Teillaud, who obsessively applies compass to map to triangulate meaning, and Jaap Rameijer, who photographs spirit orbs, among others. It touches on the history of the region with regard to Holy Grail legends, Mary Magdalene, and the Cathar genocide, but it focuses on a couple residents who deeply believe in the power of the place. While the filmmaker, Richard Stanley, himself is a believer, he lets his subjects talk themselves into positions that are simply ridiculous. It's just short of cruel, but Stanley rather surprisingly manages to generate sympathy for these characters, who are quite obviously, he admitted in the Q&A that followed the screening, nuts. Barbara "Basia" Baranowska — best known in North America for her poster for Andrzej Zulawski's Possesion — is the unsung hero of Polish poster art. Whereas the likes of Jan Lenica developed a distinct, often instantly recognizable style, Barbara Baranowska was a chameleon (as reflected in her alternating use of "Basia," "Basha" and "Bacha" as her professional name). She donned a variety of graphic personae — from the sometimes brutal cut-outs of her early Polish book jackets to voluptuous, almost psychedelic surrealism of her French film posters. While she may not be the most prolific artist of her generation, the works she produced in Poland during the 1960s and France in the 1970s are unforgettable. 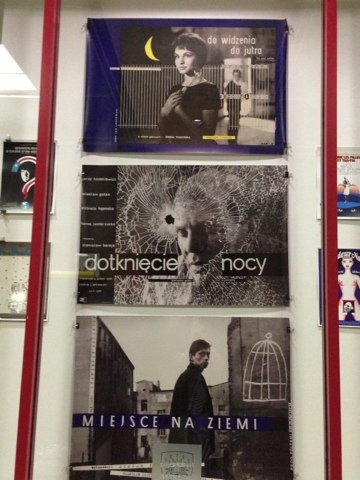 The poster exhibit ends today, but the film festival runs for a few more days.